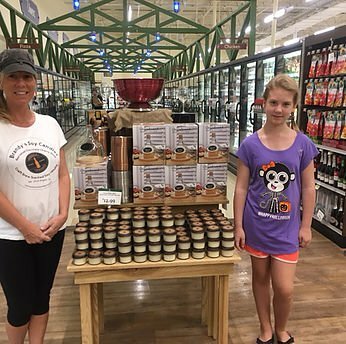 Welcome to Brandy’s Soy Candles where you can learn about our unique hand poured candles made in Angier, North Carolina! Our supplies and ingredients come from around the Triangle area and we are excited to be a part of small, local businesses of the Triangle area! 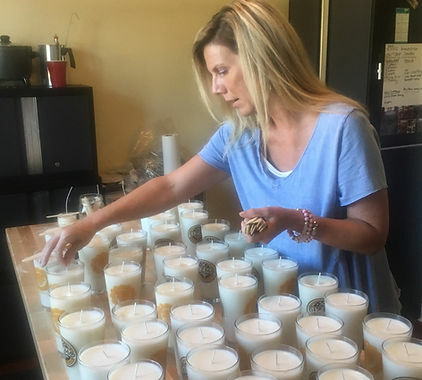 We are a small woman-owned family business, established in January 2016 and rooted in the joy of making quality soy candles for friends and family for nearly 15 years. During our first year we have created partnerships with other local businesses and can now be found in 20 locations!! Check out our “Locations We’re In” to see the different breweries, bottle shops and makers of fine spirits that now carry Brandy’s Soy Candles! I use local supplies and natural ingredients to pour craft beer and spirit scented soy wax into glassware from brewers, tap rooms and spirit shops. I have found a niche with so many local breweries that enjoy adding craft scented soy candles to their merchandise line! Brandy’s Soy Candles are reaching into bottle shops and craft spirit producers. There are so many craft breweries that could use a twist on their merchandise. Everyone has hats and T-shirts, but what about a great candle in glassware with their brewery logo? Not everyone has that, but they should! Look for them everywhere you go and enjoy the tastiest offerings in the Triangle and Sandhills. If you don’t see your favorite spot to enjoy a drink, tell them to start carrying our awesome candles! 20% off 5 or more candles and FREE local pickup when you use the code LOCAL at checkout.